It was announced today that Tommy Chong comedian, movie star, entertainer and long time advocate for marijuana rights has agreed to be the celebrity spokesperson and joint venture partner for Colorado based Canna-Saver.com, the leader in online cannabis coupons and deals serving the cannabis consumer. Colorado approved the use of recreational marijuana on January 1st, 2014 and other states will be following soon. 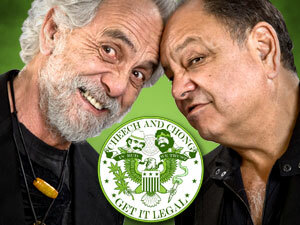 The agreement includes Tommy Chong as the key spokesperson for the Canna-Saver.com web platform and brand, which includes the usage of Tommy Chong merchandise and specialty lines. Canna-Saver.com will be the exclusive online platform for Tommy Chong branded products and co-branded items with Canna-Saver. Brian Shapiro, President and CEO of Canna-Saver said, “ We are thrilled about our new business relationship with Tommy and are looking forward to long term success in the cannabis industry.” Tommy will appear in all promotions and do several engagements throughout the year with Canna-Saver and will work in partnership to open additional markets throughout the United States and abroad to expand the Canna-Saver and Tommy Chong brands. Canna-Saver is an online company that offers coupons and daily deals catered to the marijuana/cannabis demographic that has emerged as a result of marijuana decriminalization and legalization across the U.S and the world. Canna-Saver is based in Denver Colorado and recently won a Cannabis Industry Business award for Invention of the Year. Canna-Saver has also been hailed as the "Groupon of Marijuana" on CNN Outfront with Erin Burnett, Fox News and High Times Magazine. Canna-Saver intends on expanding into additional targeted markets with California and Washington launching soon. On March 21st, the Cheech and Chong Up in Smoke tour featuring WAR is coming to the Mystic Lake Casino Hotel in Prior Lake, Minnesota. Tickets go on sale this Thursday, January 23rd at 10am local time via the ticket link above. Actor Patrick Warburton will host his fourth annual celebrity golf tournament in Palm Desert next month to raise money for St. Jude Children's Research Hospital, organizers announced Tuesday. The Patrick Warburton Celebrity Golf Tournament will be held at the Classic Club and JW Marriott Desert Springs Resort's Palm and Valley courses Feb. 27 to March 2 to benefit the hospital, which conducts research on and treats pediatric cancer and other diseases, spokeswoman Andrea Carter said. Warburton is a star of the CBS comedy "Rules of Engagement" and, on "Seinfeld," played Elaine Benes' (Julia Louis-Dreyfus) on-and-off boyfriend David Puddy. He also appeared in the movie "Ted" and is the voice of Joe Swanson on the Fox animated comedy "Family Guy." Other celebrities scheduled to play in the tournament include actors Richard Kind, Luke Perry, Scott Wolf, Kurt Fuller, Cheech Marin, Tommy Chong, Peter Gallagher, Robert Hays, Raymond Cruz, Michael Paul Chan, Sam Hennings, Bill Smitrovich, Joe Regalbuto and Brian Thompson; Fox news commentator Brett Baier, former National Football League players Jim McMahon, Robbie Gould and Sterling Sharpe, beach volleyball champion Sinjin Smith, former Major League Baseball players Ron Fairly and Steve Garvey and National Hockey League Hall of Famer Grant Fuhr. A few entertainment events will be held in conjunction with the tournament, including a new addition, "The Story Behind the Story: Songwriters Night" at the JW Marriott Desert Springs Resort in Palm Desert on Feb. 27. Nashville songwriters will tell the stories behind their songs, then perform them. Scheduled to appear are Grammy winner Kim Carnes, who has written hits for Vince Gill and Reba McEntire; Tim Nichols, who wrote Tim McGraw's No. 1 hit "Live Like You Were Dying"; Victoria Shaw, who has written songs for Garth Brooks; Rivers Rutherford, who wrote Brooks and Dunn's No. 1 "Ain't Nothing About You,"; Jeff Hanna, who wrote Rascal Flatts' No. 1 "Bless the Broken Road"; and Matraca Berg, who wrote "You and Tequila," performed by Kenny Chesney and Grace Potter. - "Celebrity Jam Session" Friday night at the Marriott. Rocker Alice Cooper, Steve Cropper of Booker T & the MGs and the Blues Brothers, Robby Krieger of The Doors, Mike Mills of R.E.M., Tommy Thayer of KISS, Mickey Thomas of Starship, John Elefante of Kansas, Carnes, Danny Seraphine of Chicago, Jeff Hanna of the Nitty Gritty Dirt Band, Teri Nunn of Berlin and Dave Brock of Wild Child. A "surprise guest" will also make an appearance, Carter said. night at the Marriott. Sixwire - the featured band on the television show "Nashville" - will perform and celebrities will walk a red carpet. In 2010, Warburton and his wife Cathy visited the main St. Jude in Memphis, Tenn., and later decided to hold a fundraiser, Carter said. Last year's tournament brought in $727,000 for St. Jude last year, more than doubling the previous year's intake. The event is the second-highest grossing golf tournament for St. Jude nationwide, after a tournament sponsored by Donald Trump in New York, Carter said. Tickets to the songwriters' event are $100, Jam Session are $125, and Saturday gala and comedy show tickets are $250. Golf is $2,000 per person. Information and tickets are available at www.thewarburton.com.